DeepSoul Holiday Edition: Take 6 - "Oh! He Is Christmas"
Take 6 lends their unique brand of jazz-inflected harmonies to a contemporary gospel tune. Acapella group Take 6 has performed with everyone imaginable, from Don Henley to Stevie Wonder. Their complex harmonies, jazz, do wop, and R&B influences, and contemporary take on gospel music has distinguished the sextet from other acapella artists. After releasing their 1988 major label debut Take 6, the group earned a Best New Artist nomination and Grammys for best jazz and gospel performances; since then, they have never looked back. Early in their career, Take 6 recorded He Is Christmas, mixing in traditional carols with original compositions. The 1991 album put their spiritual roots at the forefront of their music while incorporating modern R&B beats and harmonies to appeal to broad audiences. The title track is a perfect example of Take 6's gospel, jazz, and soul backgrounds melding into one memorable holiday tune. 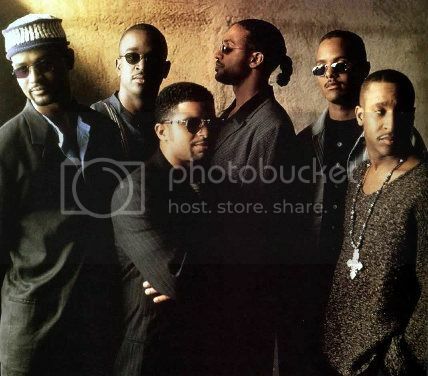 Formed in the early '80s at Alabama's Oakwood College, Take 6 originally consisted of David Thomas, Alvin Chea, Cedric Dent, Mark Kibble, Claude V. McKnight III (older brother of R&B crooner Brian McKnight), and Joey Kibble (who replaced Mervyn Warren). Initially dubbed Alliance, they changed their name to Take 6 after signing with Warner Bros. in 1987. Over the years the act has experimented with adding musical accompaniment to their silky vocals; this resulted in a minor hit with their cover of Ambrosia's "Biggest Part of Me" in 1994. But they eventually returned to their all-acapella roots on their last album, 2012's One. With or without music, Take 6 has established themselves as in-demand singers whose perfect vocal blend surpasses many of their peers' work. Written by McKnight, "Oh! He Is Christmas" features just a drum beat; the rest of the song consists of just their voices. Ranging from bass to falsetto, the group creates a rich sound that encompasses jazz and soul. The lyrics remind us that "Presents wrapped up tight/ And the evergreens are white/ Christmastime has come," but "Have we remembered to thank the Lord?" Over exquisite do wop harmonies, the lead vocalist sings his praise to the Lord: "Have we thanked You for a love so real, so perfect. . . Oh what a love/ Looks beyond my faults, my burdens." In other words, the song tells listeners not to focus strictly on the decorations and gifts, for "I can feel there's a difference on this day/ Not just because It's a holiday," they sing. They temper the message with some levity, however, as the bass singer injects a "bang!" at various points, enhancing the existing (and minimal) percussion. One of the best portions of "Oh! He Is Christmas" comes at the bridge, when the group members begin scatting and forming beautiful chord changes. When they suddenly drop a few notes on the line "He is Christmas," they create an unusual chord change that still works. It's pure jazz and expression of the season's joy and festive spirit. As the song fades out, they continue improvising and singing in sync, leaving the listener wanting more. Not surprisingly, this excellent performance earned Take 6 yet another Grammy for Best Jazz Vocal Performance in 1991. They would go on to record two more Christmas albums, 1999's We Wish You A Merry Christmas and 2009's The Most Wonderful Time of the Year. While those discs also show Take 6 at their best, this earlier work represents the group at the start of the career. "Oh! He Is Christmas" spotlights unique artists who would transform contemporary gospel and greatly broaden its audience.